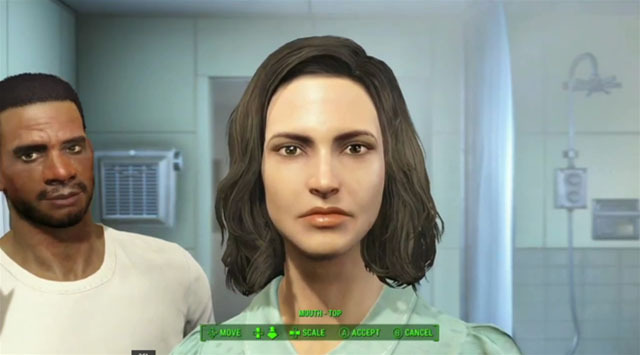 Fallout 4's likely potential is apparent before you even create your face. 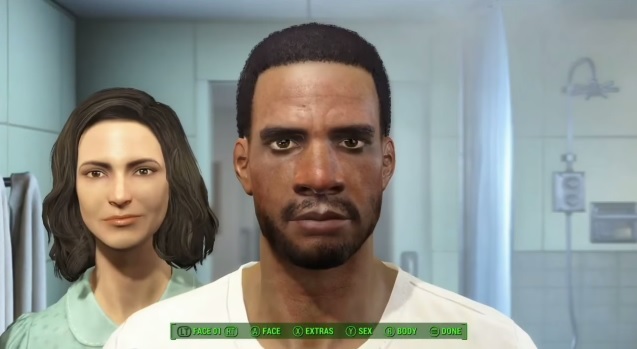 Fallout 4 has been anticipated for a long time and after such a long wait, it almost seemed as if we weren't getting another sequel but the wait is finally over after the major reveal at E3 and one of the best features it appears will be a diverse character creation system. The game starts in sunshiny Boston, before any Fallout has reared it's ugly head. We follow two characters, a married couple, who are preparing to face another day from the bathroom of their residential district American abode. As they peer into the mirror, the man's face can be customized. Starting with one of the most intriguing character creations that we're seen since The sims 4, which it seems to take most of it's inspiration from. You can create the avatar who you will control throughout Fallout 4. This is all done in front of a mirror where you can change almost everything about your avatar's appearance including their skin tone, all the way to the detail on their face. 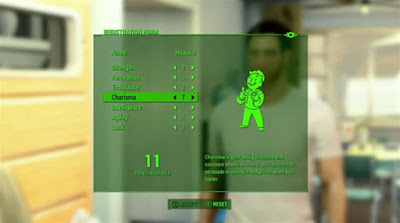 Like The Sims 4, the character's facial appearance in Fallout 4 can instantly be customized by clicking and expanding with your cursor, also kind of like the menu screen for Mario 64. Just like The Sims 4 character creation, the changes you make stick unlike of course their counterpart Mario 64, as here is where you decide on all of your character's physical attributes. The realistic thing is the two characters are perpetually caught up in a hum-drum morning chatter based around what features your focal point is on. If you adjust the nose, the wife says something like "Such a cute nose" while scrolling through facial hair options encourages the male character to respond with "What do you think hun?" Beard or no beard?" as if deciding simply whether he should shave or not. A refreshing contrast to the stiff, lifeless forms we're normally used to in character creation screens. Players are even given the chance to choose their gender in this instance, as you can create both parties, with your ultimate avatar chosen by the one you choose to leave the mirror with. This moment is also done in a attractively narrative way, as the husband and wife thrust each other back and forth to use the mirror with dialogue like "Her, my turn big guy" or "Let me just slide back in there." After your character's physical traits are selected, your avatar exits their bathroom and heads into the kitchen area for a hot cuppa and some morning grub, when the buzzer rings. Upon answering, they find a representative of Vault-Tec at the front door, who's paying you a visit to update your personal info for the Vault's database. 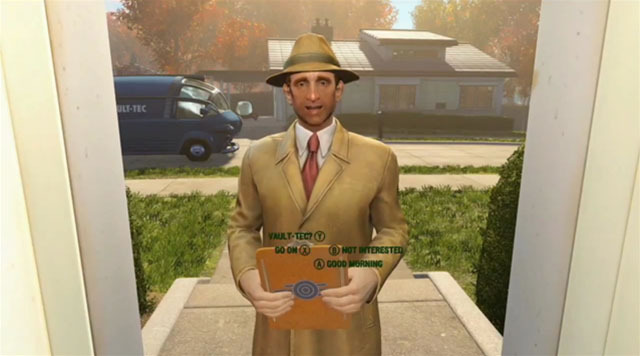 The man hands you a tablet where you disclose all your Pip-Boy needs. Your name, stats and whatnot, all being played out as one would take signing pesky security forms, with the spouse commenting "Hey, it's a piece of mind. It's worth a little paperwork right?" Thus your Fallout 4 character is born anew and by this time the player should have a good idea of what their character is all about, what kind of society they reside in and that a possible atomic threat is coming their way. What's more, the twosome has a baby whose visual aspect is generated from the features you chose for the blissful couple. Nice. Also if you're worried that you'll never see your character while playing the game, Betheda has announced that first person and third person gameplay will make it's anticipated return in Fallout 4, which is great news. Changing from first or third person has always been a game changer and it's necessary that Fallout 4 brought this feature back so we can see our avatar explore the lust world in awe. So basically like The Sims 4. Cool! In these screenshots you can see that while the faces don't look realistic they still look incredible. A great step up from Fallout 3. 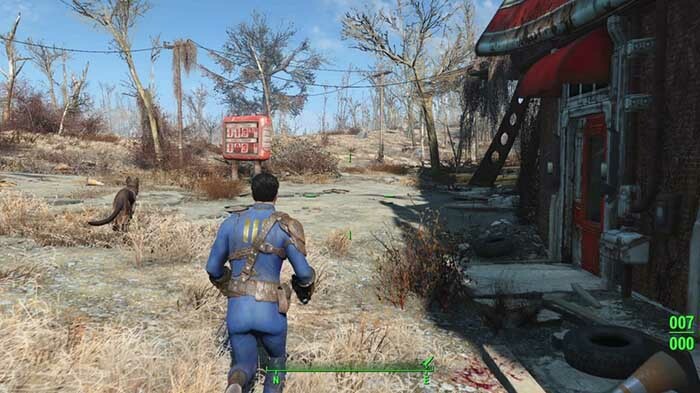 Cannot wait for Fallout 4. I guess the hype is working. Mind you, I wasn't on the Fallout 3 hype machine and still loved that. I hope they get it right. I have mixed feelings about my character talking. Looks like because of the full voice acting, they got rid of some of the more interesting dialogue selections. So, given that they not onlyt let you customize your look but that of your spouse and by extension your small child....anyone else really feel like we are gonna run into one or both of them in the wasteland? Like I kindof feel like your kid willl turn out to be some plato important character who we meet beforehand and only later learn their true identity. Either that or they will be the antagonist, with their motivations dynamically drawn from your character alignment. Wow, a big improvement over Fallout 3 and New Vegas. 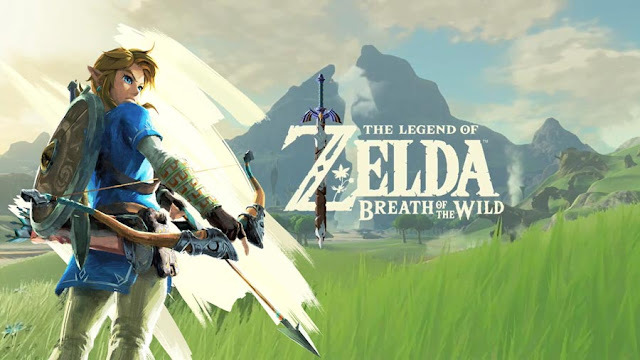 The graphics never really bothered me, I just loved the massive open worlds and rich history of the fictional world. Anyone else realize there was also a body option? I did not see one and if it does not have one how can u compare it to sims.